Detailing the physical features, habits, territorial reach and other identifying qualities of the Sycamore Tussock Moth. 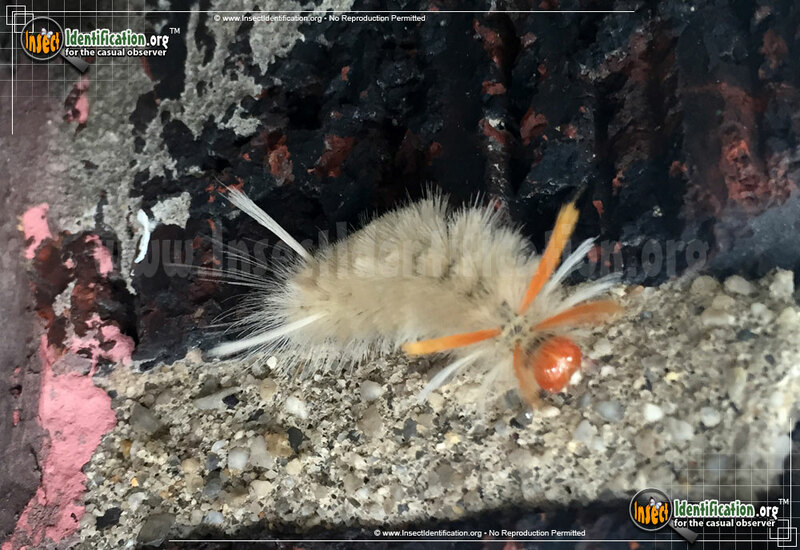 The Sycamore Tussock Moth lives on and eats off of sycamore trees, sometimes to the point of destroying them. Sycamore Tussock Moths can be found on sycamore trees and London plane trees. 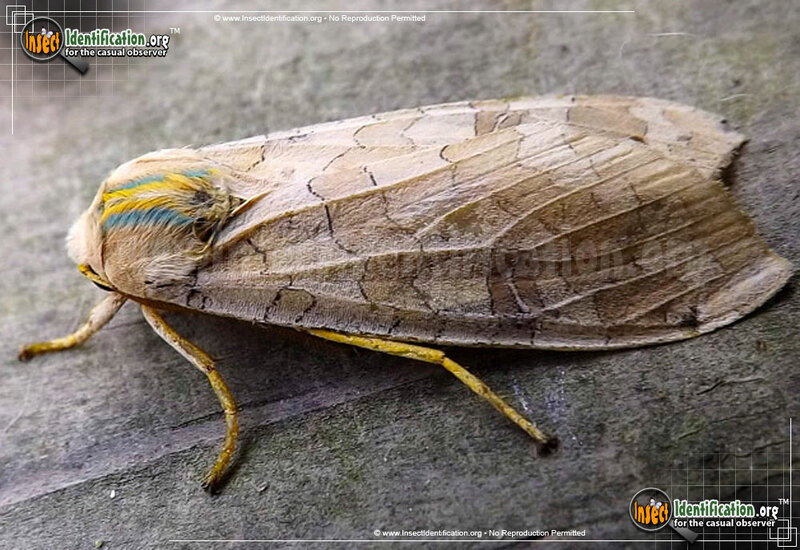 They are pale brown with alternating bands of tan and brown across the forewings. The hairy thorax has lines of white, blue, and yellow hairs running down the center. 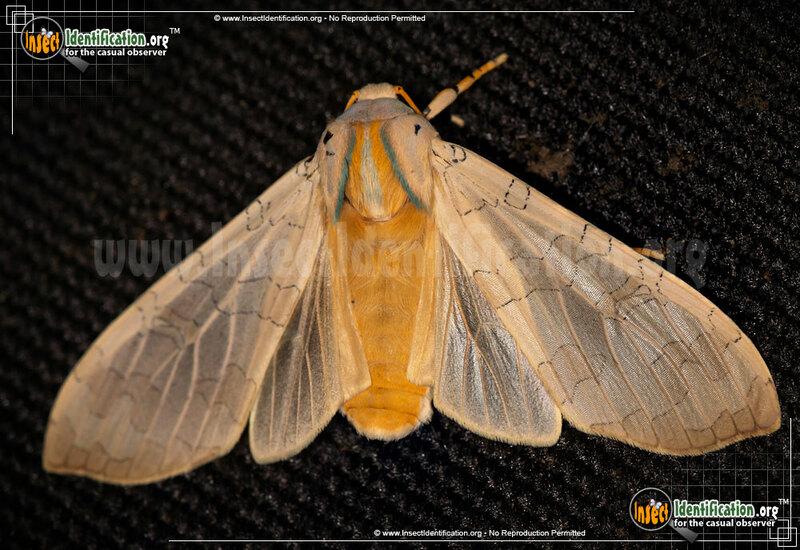 This species looks identical to the Banded Tussock Moth of the same genus, and only an anatomical inspection can really differentiate the two. 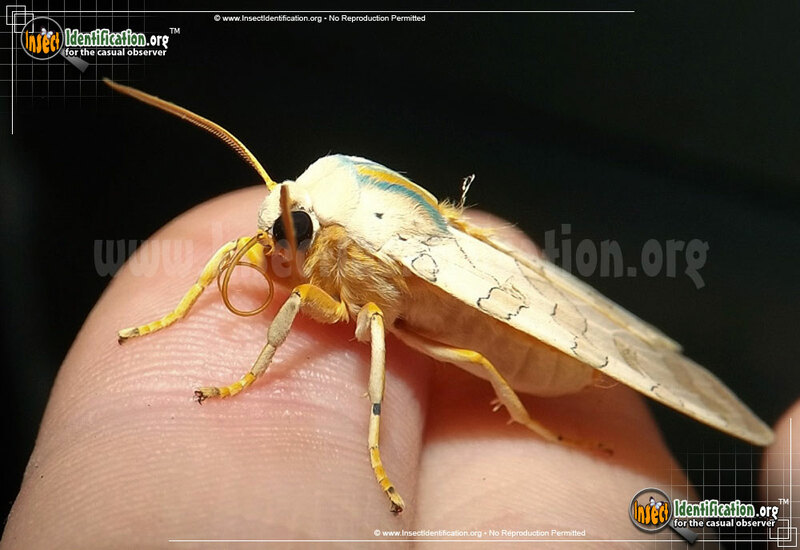 Because it is impossible to check this via a photograph, on this website, the photos attributed to this moth are also placed on the Banded Tussock Moth. Observers are more likely to find the young caterpillars on the host trees than adult moths. Often, they dangle from a branch by a fine silk strand, almost dancing their way to the ground. Sycamore Tussock Moth caterpillars grow to be about 25-35mm long. They are covered in white hairs and have orange heads. Four orange tufts (called pencils) of long bristles extend upward behind the head. Four more white pencils of long bristles are next to them. Two white pencils of long hairs extend out by the rear end. Though they are not reported to sting, this caterpillar has caused irritation on human skin, so handling them is not advised. Use a stick or paper to remove them from areas where they are not wanted. There are two to three generations each year. Females lay fertilized eggs on the tree's bark or branches. The emerging caterpillars proceed to eat away at the leaves and soft plant tissue. In large numbers, annual substantial damage to a tree can kill it over time. After 30-40 days, the caterpillars form cocoons and emerge as adults about two weeks later. An exception to that timeline is the generation of caterpillars pupating just before winter comes. These caterpillars remain in their cocoons all season long, protecting them from the elements. They emerge as flying adults the next spring and parent the first generation of the new year.